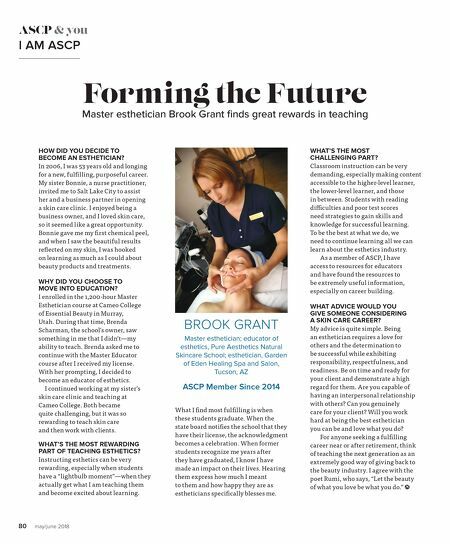 80 may/june 2018 ASCP & you I AM ASCP Forming the Future Master esthetician Brook Grant finds great rewards in teaching HOW DID YOU DECIDE TO BECOME AN ESTHETICIAN? In 2006, I was 53 years old and longing for a new, fulfilling, purposeful career. My sister Bonnie, a nurse practitioner, invited me to Salt Lake City to assist her and a business partner in opening a skin care clinic. I enjoyed being a business owner, and I loved skin care, so it seemed like a great opportunity. 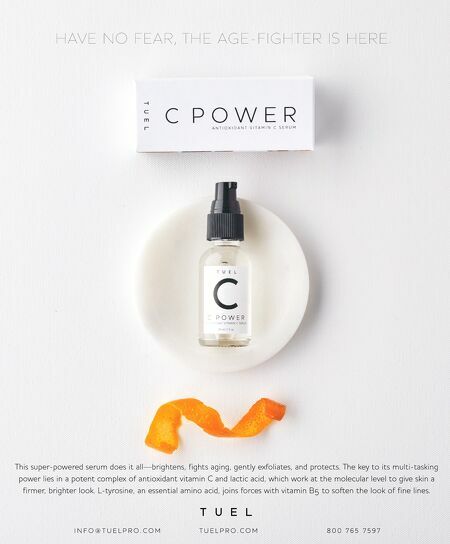 Bonnie gave me my first chemical peel, and when I saw the beautiful results reflected on my skin, I was hooked on learning as much as I could about beauty products and treatments. WHY DID YOU CHOOSE TO MOVE INTO EDUCATION? I enrolled in the 1,200-hour Master Esthetician course at Cameo College of Essential Beauty in Murray, Utah. During that time, Brenda Scharman, the school's owner, saw something in me that I didn't—my ability to teach. Brenda asked me to continue with the Master Educator course after I received my license. With her prompting, I decided to become an educator of esthetics. I continued working at my sister's skin care clinic and teaching at Cameo College. Both became quite challenging, but it was so rewarding to teach skin care and then work with clients. WHAT'S THE MOST REWARDING PART OF TEACHING ESTHETICS? Instructing esthetics can be very rewarding, especially when students have a "lightbulb moment"—when they actually get what I am teaching them and become excited about learning. What I find most fulfilling is when these students graduate. When the state board notifies the school that they have their license, the acknowledgment becomes a celebration. When former students recognize me years after they have graduated, I know I have made an impact on their lives. Hearing them express how much I meant to them and how happy they are as estheticians specifically blesses me. BROOK GRANT Master esthetician; educator of esthetics, Pure Aesthetics Natural Skincare School; esthetician, Garden of Eden Healing Spa and Salon, Tucson, AZ ASCP Member Since 2014 WHAT'S THE MOST CHALLENGING PART? Classroom instruction can be very demanding, especially making content accessible to the higher-level learner, the lower-level learner, and those in between. Students with reading difficulties and poor test scores need strategies to gain skills and knowledge for successful learning. To be the best at what we do, we need to continue learning all we can learn about the esthetics industry. As a member of ASCP, I have access to resources for educators and have found the resources to be extremely useful information, especially on career building. WHAT ADVICE WOULD YOU GIVE SOMEONE CONSIDERING A SKIN CARE CAREER? My advice is quite simple. Being an esthetician requires a love for others and the determination to be successful while exhibiting responsibility, respectfulness, and readiness. Be on time and ready for your client and demonstrate a high regard for them. Are you capable of having an interpersonal relationship with others? Can you genuinely care for your client? Will you work hard at being the best esthetician you can be and love what you do? For anyone seeking a fulfilling career near or after retirement, think of teaching the next generation as an extremely good way of giving back to the beauty industry. I agree with the poet Rumi, who says, "Let the beauty of what you love be what you do."